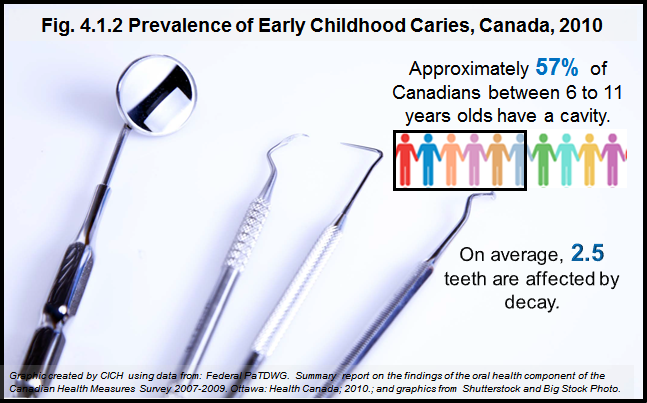 Findings from the 2010 Canadian Health Measures Survey indicate that approximately 57% of Canadian children between ages 6 to 11 years have a cavity. On average, 2.5 teeth are affected by decay. Meanwhile, 58.8% of 12 to 19 year olds have experienced cavities, with an average of 2.5 permanent teeth affected. Health Canada. Summary report on the findings of the oral health component of the Canadian Health Measures Survey 2007-2009. Ottawa: Health Canada; 2010.